Reduce service calls or trips to repair or check on equipment IntelliBox does it for you! Make sure all equipment is functioning properly at all times, without having to check it! 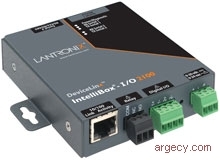 IntelliBox-I/O 2100 is a breakthrough in truly automated control of remote equipment. Powered by Lantronix EventTrak technology, this highly-advanced, programmable device server connects your equipment to an IP network and monitors it to watch for events at specified intervals. When an event occurs, IntelliBox automatically sends pre-determined, user-defined command(s) to the equipment causing it to take appropriate and/or corrective actions without any user intervention. IntelliBox can send email notification that the event was detected and handled accordingly. IntelliBox proactively monitors and controls remote digital I/O, dry contact (relay) and RS232/422/485-based equipment. With built-in EventTrak technology, IntelliBox can be set to query an attached device at timed intervals then, depending on the results, take prespecified action(s). In addition to monitoring a serial line the IntelliBox can also monitor digital I/O. Fluid-level monitoring is a simple example if IntelliBox notices a digital float sensor drop to a low level, it can trigger a relay to start the fluid pump. When the level is restored the relay is triggered to stop the pump. IntelliBox sends an email to the user notifying them of the situation and the actions taken. Instead of reacting to an event or problem, users are proactively notified that an event occurred and the appropriate response automatically took place. This also enables users to control networked equipment directly through the serial or I/O port rather than depending on a PLC or SCADA server. In some instances, several events should occur before action is taken. EventTrak allows Chain Definitions (series of events/ actions) to be defined. They can be saved, stored and transferred from one IntelliBox to another, providing a great deal of flexibility for large-scale deployment. IntelliBox is ideal for alarms, fluid pumps, motor drives, lights, fans, phone systems, access/control/alarm panels, HVAC equipment, PLC's, projectors, security cameras, proximity readers, card readers, etc. IntelliBox consolidates the task of monitoring/reporting on multiple pieces of equipment. Rather than query and review the output of each device separately, users can configure the IntelliBox to query attached equipment at configurable intervals and gather the returned data. Incoming data can be sent via email or RSS feed, allowing hundreds of devices to be monitored from one RSS-enabled web page. Incoming data can be scanned for specific information. When it is detected, IntelliBox can send an email flagged as Important along with the data and take corrective action if needed. Equipped with the Lantronix Evolution OS Networking Operating System, IntelliBox delivers enterprise-grade level networking security with built-in SSH/SSL support. The hardened OS and mature protocol stack are resilient to denial of service (DoS) and port mapping attacks and prevent it from being used to bring down other networked devices. Evolution OS uses familiar data-center standards such as a Cisco-like command line interface (CLI) very similar to that used by routers and hubs, simplifying configuration and enterprise network integration. It also incorporates XML a standard tool for web services, data transfer and rich content management that encapsulates data into a text-based format. Ideally suited for industrial applications, IntelliBox is equipped with isolated serial, I/O and Ethernet ports and screw terminal connectors for serial, I/O, relay and power. It supports Modbus TCP, Modbus ASCII and Modbus RTU and is FM-approved for hazardous locations Class 1, Div. 2. IntelliBox also features 15kV serial port ESD protection which protects the IntelliBox from electrical overstress; ESD-protected I/O channels (independent and optically isolated); wide -4075C operational temperature range; and flexible power with 9-30 VDC and 9-24 VAC input range. IntelliBox can act as a Modbus TCP slave, enabling Modbus TCP masters to monitor the status of digital inputs and set the digital outputs and relays. It can also be used as a Modbus bridge (Modbus TCP to Modbus RTU/ASCII protocol converter) enabling users to connect RS232/RS485 Modbus RTU/ASCII devices to their Ethernet network to be controlled by Modbus TCP masters (PLCs, OPC Servers, SCADA Software, etc). IBIO21002-01 IntelliBox-I/O 2100 - 2 port IA device and I/O server with EventTrak, worldwide power supply with regional adapters.